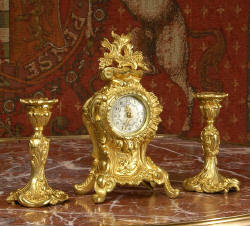 A beautiful Rococo clock set by the famous maker Japy Freres. 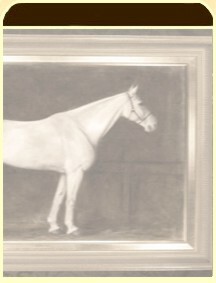 It is stunning in its original fine gilding which is bright and clean. The case is of classic Rococo design, waisted, keyhole shape with acanthus leaf shoulders and 'C' scroll feet....Click here for full details! 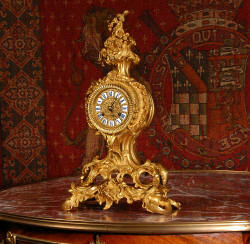 A small and very pretty clock of gilt brass in stunning condition. It has a gothic theme with the clock modelled as a architectural ruin with flying buttresses forming the feet, a coat of arms to the front and pointed tracery windows to the front and sides. 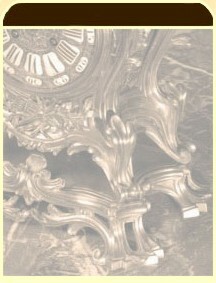 The pendulum can be glimpsed swinging within the case through the front windows. ......Click here for full details! 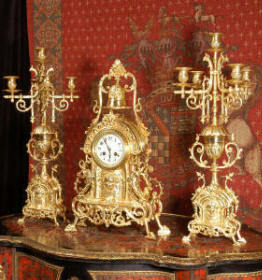 A large and stunning gilt brass antique French clock set in excellent condition. 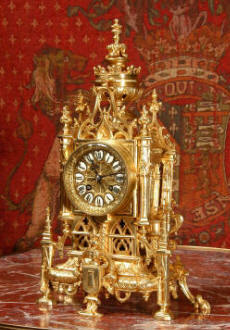 Style is French Gothic, clock case has an arched top surmounted by and ornate bell. ....Click here for full details! 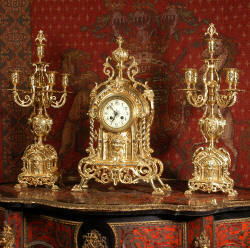 Rare and Stunning Miniature French Boudoir Clock Set . 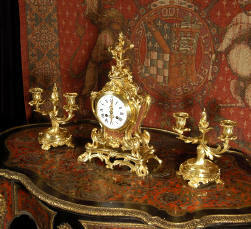 A Gorgeous Antique miniature clock set, ideal for a lady's dressing table. Rococo in design and standing just 8" or 20.5 cm in height. 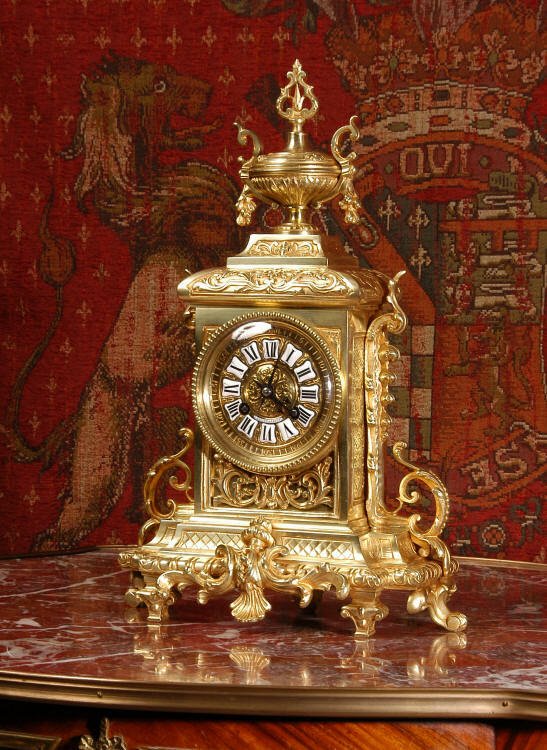 It is modelled in gilded brass and is of typical asymmetric Rococo shape with 'c' scrolls and floral decoration....Click here for full details! 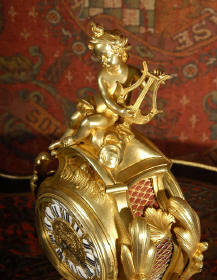 Stunning antique French boudoir clock featuring an adorable figure of a cherub playing a harp. 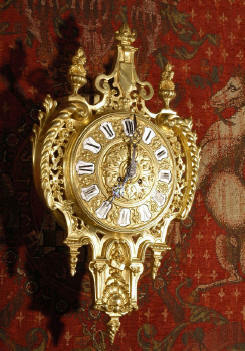 The style is Rococo, waisted keyhole shape with acanthus leaf shoulders, 'C' scroll feet and surmounted by a floral finial. The design is beautifully bold and heavily moulded in brass, well chased and finished. It is modelled in the round and so would display very well on a table. ....Click here for full details! .....Click here for full details! 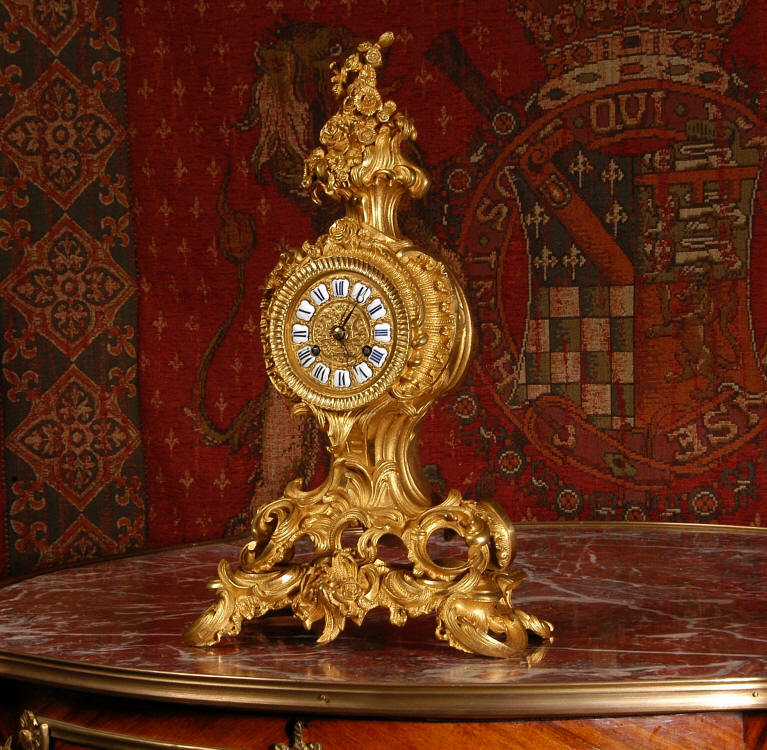 A beautiful original antique French Boudoir Table Clock. 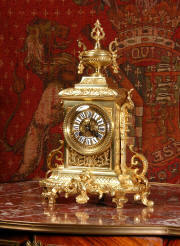 It is well modelled in the Classical Louis XVI style in gilt brass. it is architectural in shape with a blind fretted panel below the dial and an urn to the top.......Click here for full details! 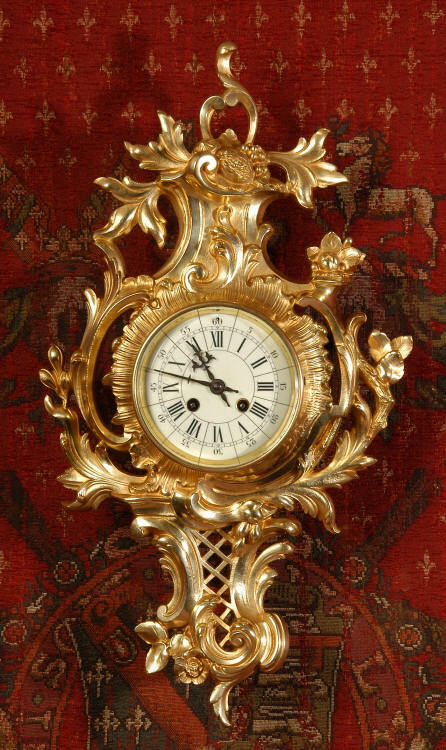 A stunning original antique French gilt brass Rococo Cartel clock, classic Rococo asymmetrical shape with 'C' scrolls, foliage and floral swags. The dial is enamel on copper with outside minute ring and original fretted blued steel hands. The modelling is crisp and well detailed with a bright and clean finish. The pendulum can just be see swinging below the dial behind the fretted panel.......Click here for full details! A beautiful and Early Antique French Rococo table clock dating from around 1850. 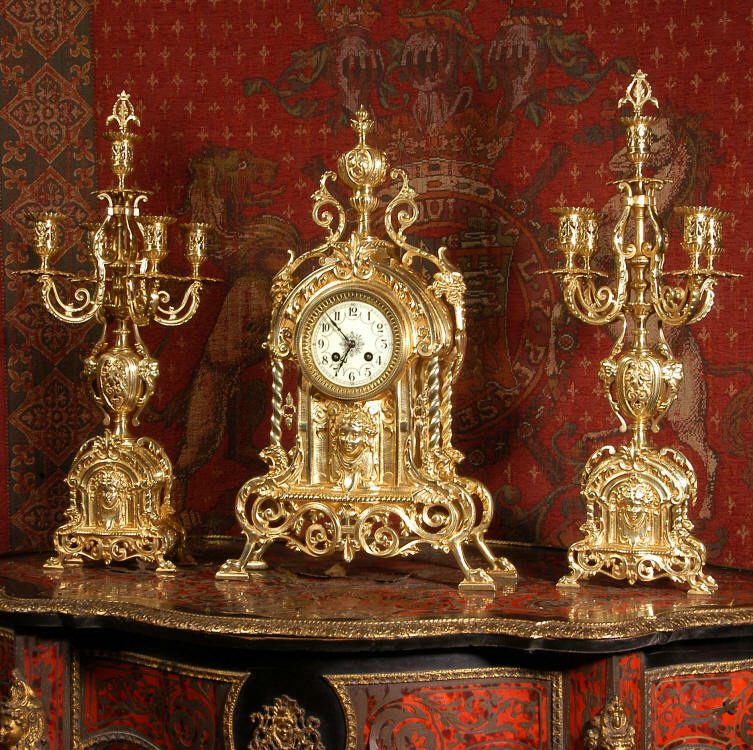 It is crisply and finely modelled in ormolu (fine gilded bronze) in a typically flamboyant Rococo design and has its original gild which is in lovely condition......Click here for full details!